Te Kawerau a Maki are the tangata whenua (people of the land) of Waitakere City, who hold customary authority or manawhenua within the city. Te Kawerau a Maki descend from the earliest inhabitants of the area. However, the Kawerau a Maki people have been a distinct tribal entity since the early 1600s, when their ancestor Maki and his people conquered and settled the district. Maki and a large group of his Ngati Awa followers from Taranaki migrated northward to the Auckland isthmus. Ultimately Maki and his people conquered the Auckland isthmus and the land as far north as the Kaipara harbour. The people of Waitakere retained the name of Te Kawerau a Maki as their tribal name. Other descendants of Maki adopted their own tribal names, such as Ngati Manuhiri and Ngati Kahupara. Maki’s great grandson Te Au o Te Whenua came to control all of the land between Muriwai and the Manukau Harbour. Following the establishment of Ngati Whatua in the Kaipara area (1700s), the Kawerau people were pushed southward and subjected to a major invasion - ‘Te Raupatu Tihore’ of ‘the conquest that laid bare’. This ‘taua’, or war party, was not seeking territory and its members were in fact closely related to the Kawerau people of Waitakere. They were seeking ‘utu’ or revenge for several unacceptable killings. After the conquest they withdrew to the southern Kaipara. Kawharu, the leader of this taua, who was from the Waikato, was killed by Te Kawerau in the southern Kaipara. There were a number of other battles between Ngati Whatua, and the north western tribal boundary of Te Kawerau a Maki was eventually established at ‘Te Taupaki’ or ‘the firmly bound peace’, a spot on the cliffs north of Te Henga beach. The name is now mis-located to the settlement of Taupaki. This peace settlement was made between Te Au o Te Whenua and the Ngati Whatua chief Poutapuaka. The north eastern boundary was established at ‘Tau Rangatira’ and Rangitopuni, or Riverhead. It was from Te Au o Te Whenua that the Kawerau people claimed and were awarded Certificate of Title to the Waitakere, Puketotara and Piha Blocks on the Native Land Court hearings of the 1860s. A further notable battle that took place on Te Kawerau land was fought in the Waitakere Ranges around Paruroa (Big Muddy Creek) between Ngati Whatua and Waiohua. 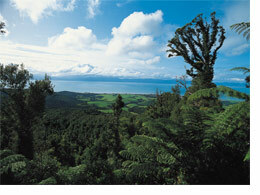 Waiohua have links through whakapapa to Tainui and are based on the eastern and southern Manukau. However, as Te Kawerau were closely related to both iwi they did not participate in the battle which Ngati Whatua won. The outcome of this battle was irrelevant to Te Kawerau status in Waitakere as neither protagonists held mana in this area. The mid-1820s brought disaster to the inhabitants of the Waitakere area when they were decimated by Ngapuhi raiding parties armed with muskets. Te Kawerau fought Nga Puhi at Te Henga and Karekare but were overwhelmed by the superior force of the musket. This devastation led to a major depletion in tribal numbers and a long period of exile in the Waikato until 1835. In the mid-1830s, the Tainui rangatira Te Wherowhero established himself at Awhitu in order to bring stability to the Tamaki region. Under his protection Te Kawerau returned to Kakamatua on the Manukau coast while Te Taou hapu of Ngati Whatua and Ngaoho established themselves at the Karangahape pa on Puponga Point. Soon after they moved to Mangere and Onehunga and by 1838 they had settled at Okahu and Orakei on the Waitemata Harbour. They never again occupied West Auckland. Te Kawerau a Maki re-established themselves in pa and kainga throughout West Auckland. At Te Henga they built a musket pa as further attack from Nga Puhi was a possibility and they may have once again needed to give their lives in defence of their lands. 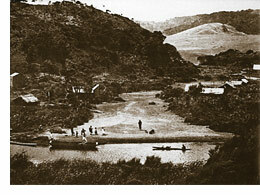 Other settlements included Ngongetepara (Brighams Creek), Waikotukutuku (near Hobsonville), Te Wai o Pareira (Henderson Creek), Kopupaka and Maanu Te Whau near the mouth of the Henderson Creek, Orukuwai (Te Atatu), Oratia and Pukearuhe (Henderson Valley). On the northern Manukau they lived at Motukaraka (near Green Bay), Waikumete (Little Muddy Creek), Kakamatua and Te Rau o Te Huia. Life in the area soon began to change, however. Crown and individual land purchases had begun in the upper Waitemata Harbour area in 1844, and by the early 1850s the Crown began to eye the northern Waitakere Ranges. In 1853 and 1854 the Crown purchased most of the Waitakere Ranges. They did not investigate manawhenua but negotiated these purchases with a number of iwi not resident in the area. Te Kawerau were the only iwi to receive ongoing payments for land in West Auckland from the Crown until 1874. Ngati Whatua had no land reserves nor other established land interests in West Auckland. Although Te Kawerau retained their most important settlement areas and were the only iwi to have permanent settlement in the area, they were not involved in the sale of much of their land. Throughout the 1860s and 1870s Te Kawerau had regular contact with Europeans, including the first wave of settlers, and they welcomed the material benefits that European settlers brought. The last two decades of the nineteenth century were however, a time of disillusionment, cultural isolation and population decline for the iwi, as for iwi throughout New Zealand. The arrival of the railway at Waitakere in 1881 brought some material benefits but also an increasing number of settlers, thus placing greater pressure on Te Kawerau to sell their remaining land. It also facilitated the milling and destruction of the remaining kauri forest, and was accompanied by the desecration of many sacred places by some of the new arrivals. Te Kawerau a Maki remained primarily in the Waitakere River and Piha areas, and maintained the only papatipu settlements in the West. However, following the death of their chief Te Utika Te Aroha in 1912 most of those remaining moved to the settlements of their close relatives at Orakei and Pukaki. They still retained land at Te Henga and returned intermittently to occupy it until the 1960s, by which time the reserved land had been sold as a result of the individualisation of land titles introduced by the Native Land Act, and economic pressures. No other iwi occupied West Auckland at any time during this period. Over the last 150 years Te Kawerau a Maki have alone kept their fires burning in West Auckland. They have retained ahi ka roa and manawhenua. Today Te Kawerau a Maki live throughout the west and wider Auckland region and maintain a close relationship with the Waitakere Area. They are rapidly re-establishing their physical presence having identified land for a new marae, and have placed an eleven metre pou at Arataki depicting the ancestors of the Ranges.